The Downs. 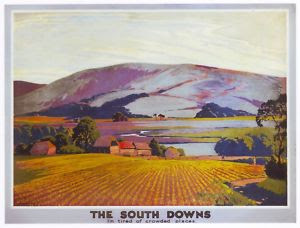 The solemn, swollen hills; the perpetual sward of the south, stretching from Winchester in the west to Eastbourne in the east. Undulating, by turns it slopes and sheers to the sea in the south; the covering of ancient woodland cleared millennia ago, ovine-manicured grassland now dominates. At the eastern edge, its northerly face gazes down onto the villages under its shadow and to the distant settlements of the Weald. The Downs: the grass below, above, the vaulted sky. The Downs. And on a day in June 1958, between its silhouetted escarpment and the orange-tinged archipelago of late evening altocumulus cloud, a tall figure could be seen. Avoiding the main path, occasionally obscured by gorse, it was restlessly heading west, intent on descent before the sun finally set. The open landscape of chalk and grass spread before him, the benign breeze faced him; the intersection of stile-less farmers’ fences his only obstacle. He had seen no others since before he had begun his climb when he crossed the Lewes Road and his form, illuminated in the half-lights of a speeding Morris Oxford, had startled the driver into swerve and skid. More anxious than usual on this day to be off the Downs, Ridler’s object – the Beacon – was still some two miles distant. For the past year, he had avoided the nightwalking that had sustained him during his first seven in Downland. Now, he preferred only the interregnum - dusk and twilight - but the risk of capture in the gaze of others was always present. It had been like this before, but in those years from the summer of 1950 he had found some acceptance and, from it, a freedom. The Writer had changed that a year ago to the day and Ridler had barely understood; but he had resolved to remove the risk of a repetition of the events of that previous June.